After lots of Post-Harvey uncertainty at the beginning of 2018, the Houston Real Estate market had a record year. Single-family home sales for 2018 surpassed 2017’s record volume by nearly four percent. But as 2019 gets underway, there continues to be uncertainty about the year ahead. Housing inventory remains tight and single-family home sales and total property sales are down. 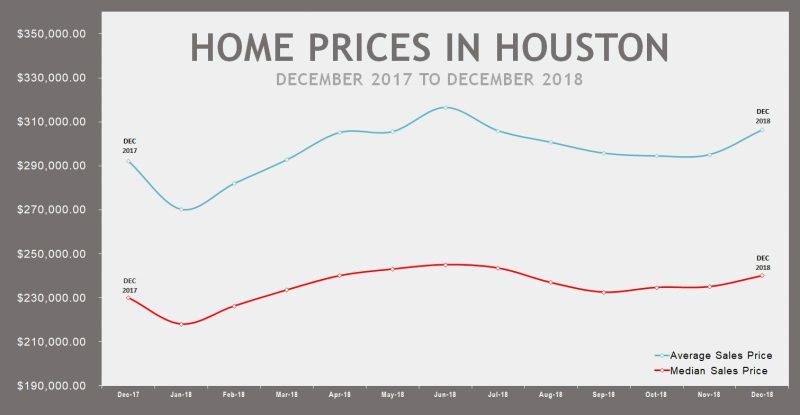 According to the latest report from the Houston Association of Realtors (HAR), 7,709 single-family homes sold in December compared to 8,079 a year earlier for a 4.6-percent decline. Despite a sluggish December, a record 82,177 single-family homes sold during 2018. That represents an increase of 3.8 percent from the previous record of 79,143 in 2017. The single-family home median price rose 3.4 percent to $240,000, and the average price increased 4.7 percent to $306,314. For the entire of 2018, the average sales prices finished at $298,982, which was 2.6% from 2017. The median sales price finished up 3.3% from 2017. According to the Houston Association of Realtors, total active listings, or the total number of available properties, jumped 13.3 percent from December 2017 to 37,554. Days on Market (DOM), or the number of days it took the average home to sell, rose from 63 to 64. Single-family homes inventory grew slightly from a 3.2-months supply to 3.5 months. For perspective, housing inventory across the U.S. currently stands at a 3.9-months supply, according to the latest report from the National Association of Realtors (NAR). Going forward in 2019, we remain hopeful that the good times will continue. According to Institute for Regional Forecasting, the Houston economy will be driven mainly by the price of oil. Although oil prices have fallen in the last couple of months, they have recently leveled out in the low $50/barrel range. Specific to real estate, interest rates rose over the course of 2018 and they are expected to rise further in the coming months. However, they still remain at historic lows. Regardless of the of the economic factors that fit the Houston real estate market as a whole, real estate remains a hyper local business. Some neighborhoods will perform better than others. Some properties will perform better than others. Bottom line, if you are interested in buying and selling in 2019, consult with a professional to see how your property or neighborhood is impacted by all of these factors.